The Ardagh Hoard, best known for the Ardagh Chalice, is a hoard of metalwork from the 8th and 9th centuries. Found in 1868 by 2 young local boys, Jim Quin and Paddy Flanagan, it is now on display in the National Museum of Ireland in Dublin. It consists of the chalice, a much plainer stemmed cup in copper-alloy, and four brooches, three elaborate pseudo-penannular ones, and one a true pennanular brooch of the thistle type; this is the latest object in the hoard, and suggests it may have been deposited around 900 AD. The chalice ranks with the Book of Kells as one of the finest known works of Insular art, indeed of Celtic art in general, and is thought to have been made in the 8th century AD. Elaborate brooches, essentially the same as those worn by important laypeople, appear to have been worn by monastic clergy to fasten vestments of the period. The hoard was found in late September 1868 by two boys, Jim Quin and Paddy Flanagan, digging in a potato field on the south-western side of a rath (ring fort) called Reerasta, beside the village of Ardagh, County Limerick, Ireland. Paddy Flanagan remained in Ireland and is buried in the Pauper's Graveyard in Newcastle West. Jim emigrated to Australia, spending his later years in Melbourne. He is buried in Fawkner Memorial Park in the city following his death there in 1934. The chalice held the other items, covered merely by a slab of stone; the pieces must have been interred in a hurry, probably temporarily, as though the owner probably intended to return for them at a later time. The brooches found with the chalice show that it was not buried until the Viking period. It was sold to George Butler, Catholic Bishop of Limerick, by Quin's mother. The chalice is a large, two-handled silver cup, decorated with gold, gilt bronze, brass, lead pewter and enamel, which has been assembled from 354 separate pieces; this complex construction is typical of early Christian Irish metalwork. The main body of the chalice is formed from two hemispheres of sheet silver joined with a rivet hidden by a gilt-bronze band. The width across its rim is 7.5 inches wide. The names of the apostles are incised in a frieze around the bowl, below a girdle bearing inset gold wirework panels of animals, birds, and geometric interlace. Techniques used include hammering, engraving, lost-wax casting, filigree applique, cloisonné and enamel. Even the underside of the chalice is decorated (photo above). According to the art historian Lawrence Stone (writing before the discovery of the Derrynaflan Hoard): "Here the Irish artist has shown a capacity for classical restraint by a deliberate decision to prevent the ornamentation from spreading so copiously as to blur the proportions... contrasting markedly with the lavish ornamental spread of the almost contemporary Tara Brooch and the still more elaborate systems of the later period. The bulk of the decoration consists of exquisitely drawn spiral or interlace patterns, given depth by the soldering of two layers of gold thread one on top of the other. At intervals are set cloisonné enamel bosses of blue and red, the complicated manufacture of which shows direct continuity with the Anglo-Saxon jewellers' craft of the preceding century. But apart from the extraordinary perfection of execution of this elaborate decoration, what gives to the Ardagh Chalice its outstanding position in Irish metalwork is the strictness of the relationship between the simple swelling lines of the cup and its base and the arrangement of the glittering studs, bands, and roundels that adorn its surface." The standard monograph is L.S. Gógan, The Ardagh Chalice. The chalice is similar to the only other major early Irish example to survive, the Derrynaflan Chalice, found in the neighbouring County Tipperary. That was found with a paten and liturgical strainer. At that time the ruling dynasty in Tipperary and most of Munster were the Eóganachta, while their allies and possible cousins the Uí Fidgenti ruled in the Limerick area (see Byrne 2001; Begley 1906). Although the early suggestion that the chalice was fabricated at Clonmacnoise and stolen from there by a Limerick Dane is widely circulated, this is unprovable. A Munster origin is just as likely if not more so given the 1980 discovery of the sister Derrynaflan Hoard. A Clonmacnoise origin is not mentioned at the National Museum of Ireland website. The chalice was featured on a £1 value definitive postage stamp issued by An Post between 1990 and 1995 as part of the series Irish Heritage and Treasures designed by Michael Craig. Two Gaelic Athletic Association trophies are modelled on the Chalice: the O'Duffy Cup and the Sam Maguire Cup. ^ O'Brien, Máire; O'Brien, Conor Cruise (1999) . "Christianity to the Coming of the Normans". Ireland: A Concise History (3rd ed. (rev.) and reprinted ed.). New York, NY: Thames and Hudson. p. 34. ISBN 0-500-27379-0. Bhreathnach, Edel, "The cultural and political milieu of the deposition and manufacture of the hoard discovered at Reerasta Rath, Ardagh, Co. Limerick", in Mark Redknap (ed. ), Pattern and Purpose in Insular Art. Oxbow Books. 2001. Wikimedia Commons has media related to Ardagh Hoard. Cloisonné is an ancient technique for decorating metalwork objects. In recent centuries, vitreous enamel has been used, and inlays of cut gemstones, glass and other materials were also used during older periods. The resulting objects can also be called cloisonné. The decoration is formed by first adding compartments to the metal object by soldering or affixing silver or gold wires or thin strips placed on their edges. These remain visible in the finished piece, separating the different compartments of the enamel or inlays, which are often of several colors. Cloisonné enamel objects are worked on with enamel powder made into a paste, which then needs to be fired in a kiln. The Derrynaflan Chalice is an 8th- or 9th-century chalice, that was found as part of the Derrynaflan Hoard of five liturgical vessels. The discovery was made on 17 February 1980 near Killenaule, County Tipperary in Ireland. According to art historian Michael Ryan the hoard "represents the most complex and sumptuous expression of the ecclesiastical art-style of early-medieval Ireland as we know it in its eighth- and ninth-century maturity." The area known as Derrynaflan is an island of pastureland surrounded by bogland, which was the site of an early Irish abbey. The chalice was found with a composite silver paten, a hoop that may have been a stand for the paten, a liturgical strainer and a bronze basin inverted over the other objects. The group is among the most important surviving examples of Insular metalwork. 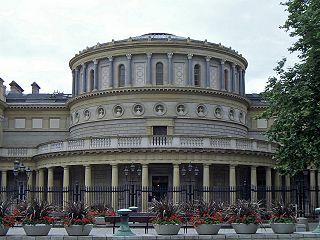 It was donated to the Irish State and the items are now on display in the National Museum of Ireland. Migration Period art denotes the artwork of the Germanic peoples during the Migration period. It includes the Migration art of the Germanic tribes on the continent, as well the start of the Insular art or Hiberno-Saxon art of the Anglo-Saxon and Celtic fusion in the British Isles. It covers many different styles of art including the polychrome style and the animal style. After Christianization, Migration Period art developed into various schools of Early Medieval art in Western Europe which are normally classified by region, such as Anglo-Saxon art and Carolingian art, before the continent-wide styles of Romanesque art and finally Gothic art developed. Hanging bowls are a distinctive type of artifact of the period between the end of Roman rule in Britain in c. 410 AD and the emergence of the Christian Anglo-Saxon kingdoms during the 7th century. 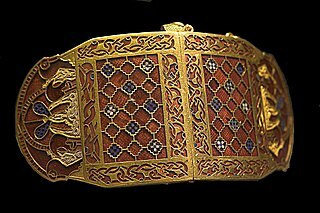 The surviving examples have mostly been found in Anglo-Saxon graves, but there is general agreement that they reflect Celtic traditions of decoration. The Treasure of Gourdon is a hoard of gold objects of which date to the end of the fifth or the beginning of the sixth century AD. They were secreted soon after 524. It was unearthed in 1845 near Gourdon, Saône-et-Loire. Insular art, also known as Hiberno-Saxon art, is the style of art produced in the post-Roman history of Ireland and Britain. The term derives from insula, the Latin term for "island"; in this period Britain and Ireland shared a largely common style different from that of the rest of Europe. Art historians usually group insular art as part of the Migration Period art movement as well as Early Medieval Western art, and it is the combination of these two traditions that gives the style its special character. The Tassilo Chalice is a bronze chalice, gilded with silver and gold, dating from the 8th century. The chalice is of Anglo-Saxon design, and has probably been at Kremsmünster Abbey, Austria since shortly after it was made. 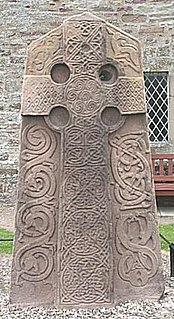 The Cross of Cong is an early 12th-century Irish Christian ornamented cusped processional cross, which was, as an inscription says, made for Tairrdelbach Ua Conchobair, King of Connacht and High King of Ireland to donate to the Cathedral church of the period that was located at Tuam, County Galway, Ireland. The cross was subsequently moved to Cong Abbey at Cong, County Mayo, from which it takes its name. It was designed to be placed on top of a staff and is also a reliquary, designed to hold a piece of the purported True Cross. This gave it additional importance as an object of reverence and was undoubtedly the reason for the object's elaborate beauty. Ardagh Fort is a ringfort (rath) and National Monument in County Limerick, Ireland, famous as the discovery site of the Ardagh Hoard.